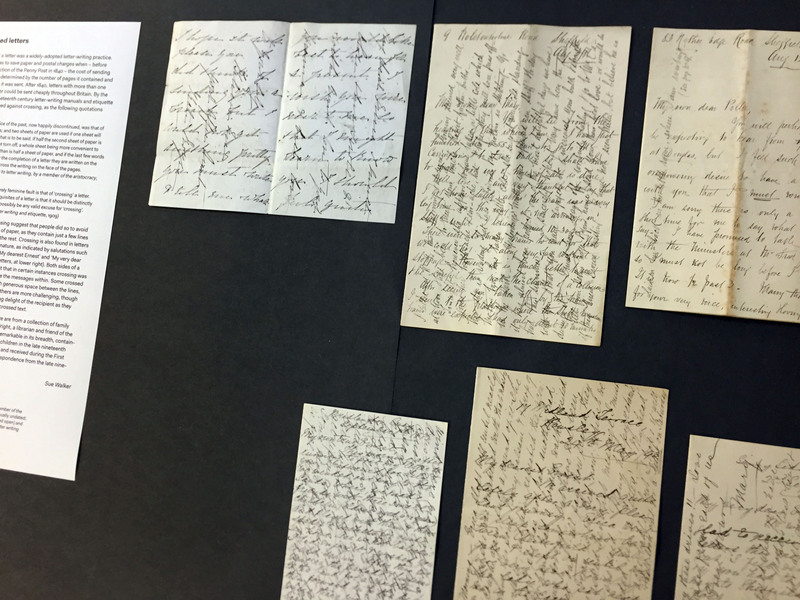 In the second in a series of posts about artefacts in the exhibition ‘Material histories’ (now on in the Department), Sue Walker tells the story of ‘crossed letters’. Crossed letters, 1880s–1910s, from the collection of Sue Walker. Some examples of crossing suggest that people did so to avoid starting a second sheet of paper, as they contain just a few lines written at 90 degrees to the rest. Crossing is also found in letters of a personal or intimate nature, as indicated by salutations such as ‘My own true Ernest’, ‘My dearest Ernest’ and ‘My very dear Ernest’ (see row of three letters, at lower right). Both sides of a sheet fully crossed suggest that in certain instances crossing was a deliberate ploy to disguise the messages within. Some crossed letters, especially those with generous space between the lines, are relatively easy to read. Others are more challenging, though one can imagine the unfolding delight of the recipient as they slowly deciphered a densely crossed text. The crossed letters shown here are from a collection of family letters given to me by Vivian Wright, a librarian and friend of the Department. The collection is remarkable in its breadth, containing letters sent and received by children in the late nineteenth century, love letters, letters sent and received during the First World War, and day-to-day correspondence from the late nineteenth century to the 1960s.